The Chinese Shar Pei originates from Guangdong region of China, but it's exact timeline is uncertain. History tells us that it was probably around as early as 200BC. It is believed to be descended from the Chow Chow, but the only real link is the unusual shared blue-black tongue. It was originally kept as a farm dog, for herding, as a watchdog and companion. 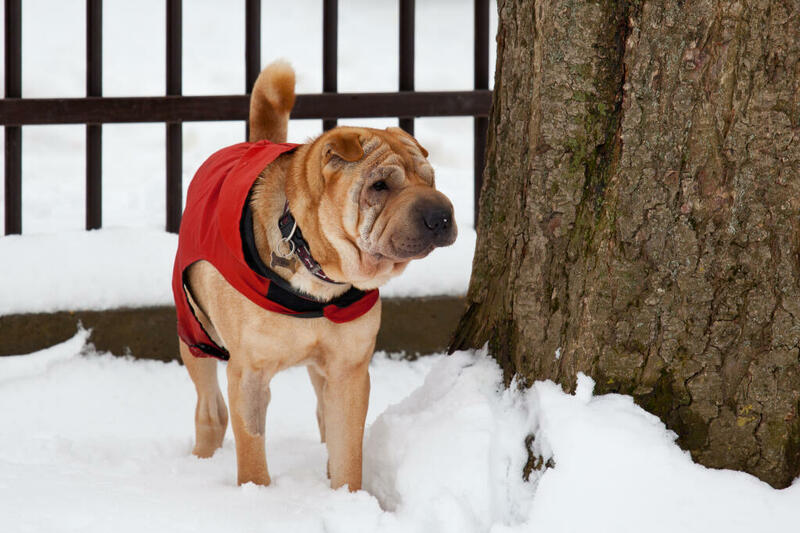 Shar Peis are confident, calm and devoted to their families. 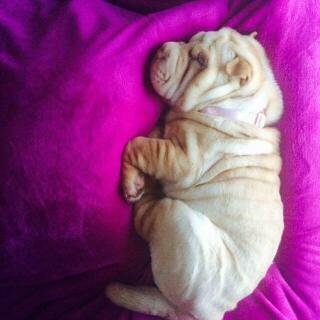 It is vital that they are socialised from 8 weeks with other dogs and strangers to prevent further down the line. They are usually fine with other pets but can become dog aggressive at times. 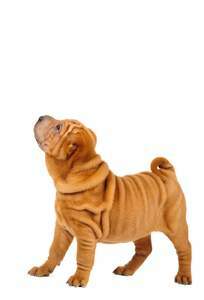 Shar Peis bond very quickly with people and like regular attention and interaction with their human family. 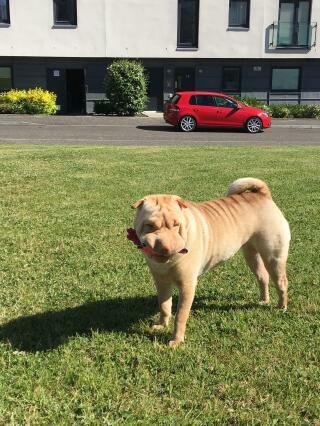 They get on well with children and are tolerant up to a point. They house train quickly, even 'asking' to go outside from as young as 8 - 10 weeks old. 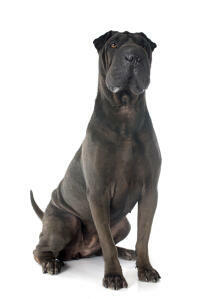 Whilst they can be stubborn, they respond best to fair, compassionate training and can rebel if shouted at. 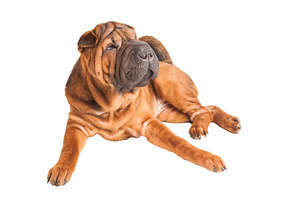 Work on socialising with other dogs needs to be constant to stop aggression. Being originally bred as Palace guards, they make good watchdogs, but this can give them the tendency to be territorial in the home. They rarely bark, so you know something is wrong if they do. 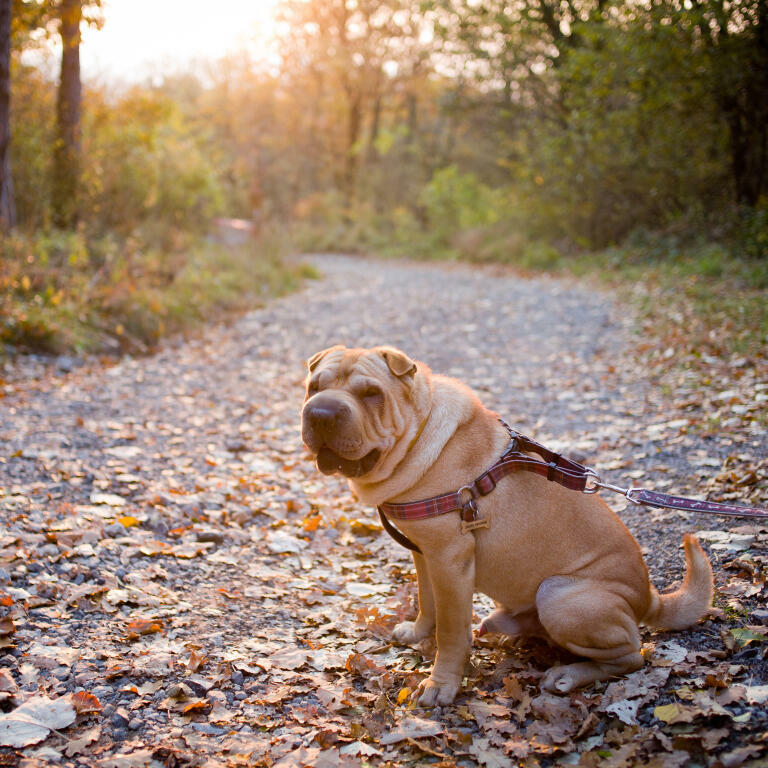 Highly suspicious of strangers, so early socialisation cannot be stressed enough; inviting as many people into your home as possible is very important with this breed. They need to be taught that strangers coming into the home is ok as they can be very protective of their family. Within a family they are completely devoted and affectionate. They will always want to be with you and dislike being left alone. Shar Peis need a fair amount of exercise, but have a tendency to overheat in extreme temperatures. Health wise, the characteristic skin wrinkles can develop allergy induced skin infections, as well as Entropion, where by the eye lashes curl inward; left untreated it can cause blindness. 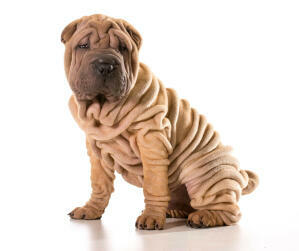 The extreme wrinkles seen in puppies become less pronounced as the dogs age and 'grow into' their skin. 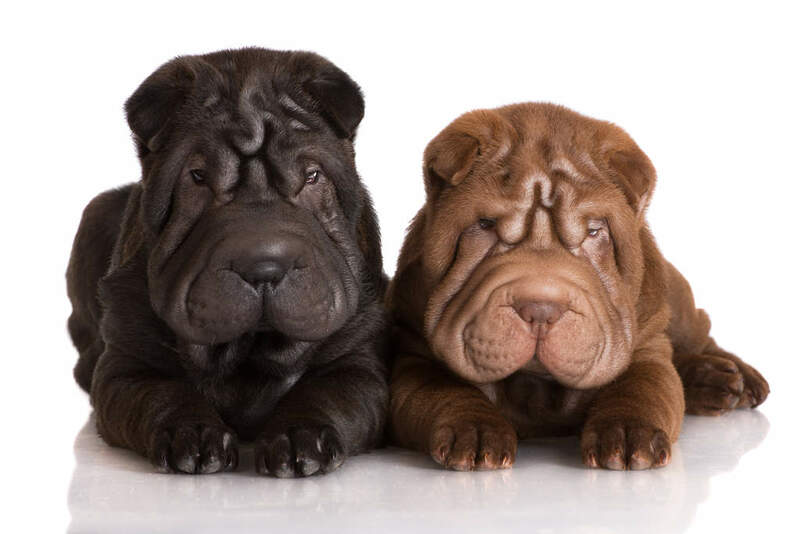 Familial Shar pei Fever (FSF) is a congenital disease with no early test available. 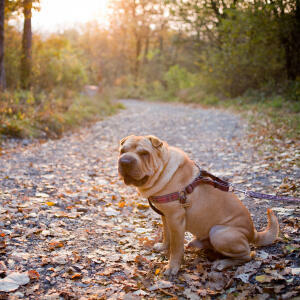 However, with treatment the dog can live a normal life. The short bristly coat requires only occasional brushing. 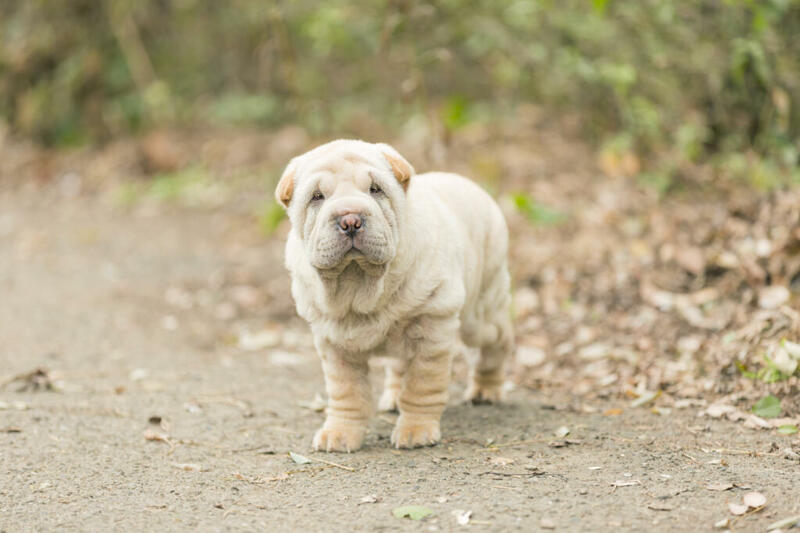 Chinese Shar Peis have a stubborn and protective temperament. 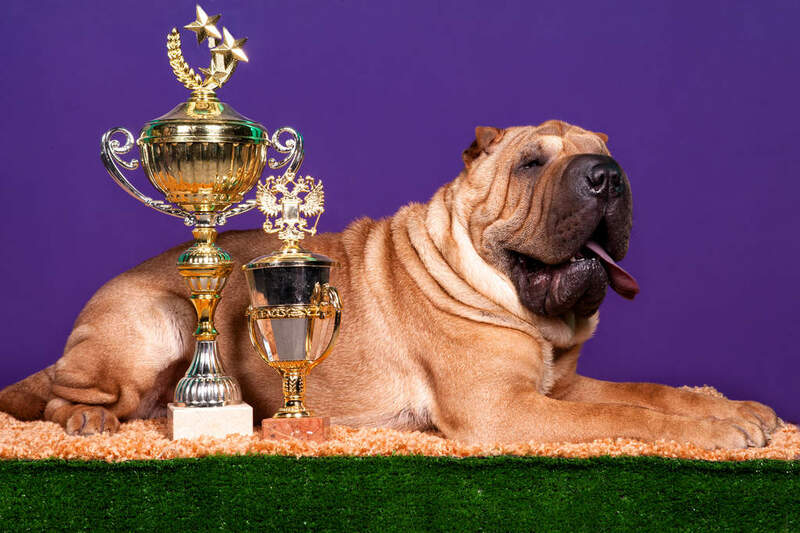 It is important that consistency is kept when training them in order for them to respect their owners. 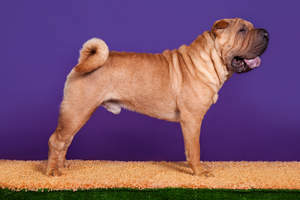 They will become devoted to their family and can become terriritorial and aggressive towards strangers and other dogs. This makes it paramount that early socialisation begins in puppyhood. 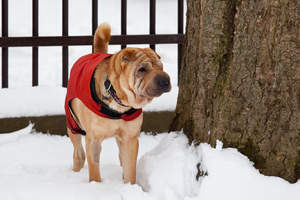 Shar Peis have a strong prey drive and prefer to be dominant so they do not always get on with other dogs and will chase cats unless they have early training/exposure. 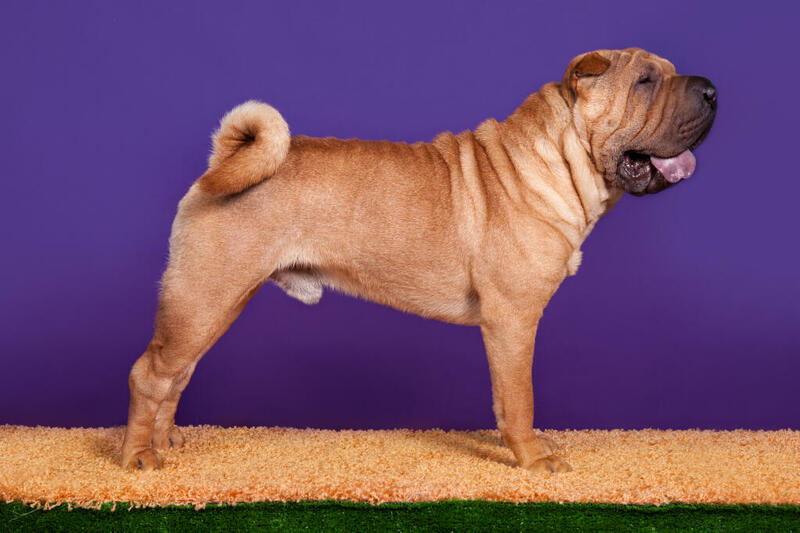 Health problems that may affect Chinese Shr Peis inlclude entropion (inward rolling of eyelid causing irritation), canine hip dysplasia (CHD), ear problems, skin problems (folds in skin need regualr cleaning), allergies and patellar luxation (dislocation of the knee cap).